Make someone’s birthday a deliciously big chocolate caramel apple day. This tart Granny Smith apple is over one pound, and dipped in creamy caramel, then sprinkled with milk chocolate rainbow candy and laced with white confection drizzle. Happy Birthday indeed! Measures 8”H x 4”W x 4”L Arrives festively tied with curled multi-colored ribbons. This chocolate gift is exceptionally fresh and requires 2-Day delivery. 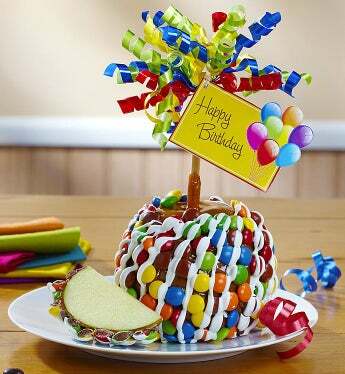 Make someone's birthday a deliciously big chocolate caramel apple day. This tart Granny Smith apple is over one pound, and dipped in creamy caramel, then sprinkled with milk chocolate rainbow candy and laced with white confection drizzle.